Ask fellow campers about "Spanish Trail RV Park & Campground" and nearby attractions. The service at this park is great, as are the sites. There is gravel throughout the park so the surface is easy to navigate. The site we were on was level, no adjustments needed. The utilities were great and the bathrooms and showers were among the best we've seen. Each shower area has a toilet and lots of room. They are all tiled so it is the same quality as new homes. Almost all of the parks in Moab are located "on the hi-way" so noise is an issue. We just played the radio while we were inside. We had a good experience and would stay here again as it is located outside of town (just a few miles). We camped at Spanish Trail RV Park & Campground in a Travel Trailer. Would recommend Dead Horse Point State Park, second to Arch's National Park as the second best place to visit. It has views of Canyonlands National Park and is much easier to navigate. Moab is a big town so there is anything you need in town. We had to get a window chip fixed so we went to Rick's Glass. Their service and pricing was great! Cleanest shower house out there. Clean and well kept park. Service great and will be going back. Just get out and see the area....even if your only there for a night. We camped at Spanish Trail RV Park & Campground in a Fifth Wheel. Easy check in, no problem with reservation. Level pull through, just long enough for 36' motorhome. Room on the side to park the tow car. Utilities worked well and easily accessible. Sites fairly close but workable with grass strip and table. Excellent cable tv. While we didn't use them, the pool and hot tub looked really nice. Good Verizon signal. A lot of traffic noise from US 191. We had to leave one day early and the office cheerfully gave a refund for the day. We would stay again. We camped at Spanish Trail RV Park & Campground in a Motorhome. Park is entirely satisfactory, but somewhat expensive, since it is not superior to others with similar facilities. We camped at Spanish Trail RV Park & Campground in a Motorhome. This park is located on the edge of town. The views of the mountains behind the park were quite nice. Out site, 512, was located on the back row as far from the road as possible. Road noise was minimal. Because we had an end site, we had lots of room around the picnic table and no neighbor to contend with on the front side of the camper and we enjoyed some shade. There was ample space between the sites. The site was just long enough for our 40' 5th wheel, but there was ample parking behind the camper for our truck. There was no patio, but the picnic table sat on a lovely small, green yard. The campground was hosting a rally while we were there and the group took advantage of the small pavilion area. All in all, this was a nice campground and we would return. We camped at Spanish Trail RV Park & Campground in a Fifth Wheel. Go to Canyonlands! It's not as crowded as Arches and the scenery is phenominal. It's worth taking the short hikes at each overlook. Stop by the visitor center for more information. 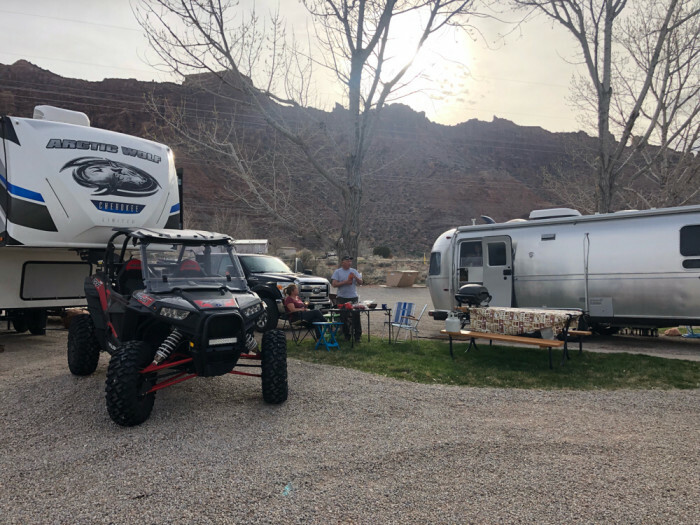 This park is on the southeast end of town a ltttle further out of Moab than some other parks; but, it is worth the extra driving to get the lovely clean cool pool and wonderful clean hot tub that is actually hot! We camped at Spanish Trail RV Park & Campground in a Fifth Wheel. We made reservations for a pull thru site one month before arrival using the parks online reservation system. We received an email confirming our site number and day of arrival. Upon arrival, we were assigned a pull in site. The park employee said that the site we reserved was a fifth wheel site. On the second day of our stay I noticed that the site we had originally requested was occupied by a motorhome. We were then told that that motorhome required a 50 amp service for their refrigerator. We have a Class C motorhome and that information was included on the reservation form. The pull in site we stayed in was facing a chain length fence with a small building on the other side of the fence. The pull thru site we reserved and they confirmed was an end site with large tree and nice landscaping. We paid the same rate for the small pull in site with no view or landscaping. Other than this bait and switch tactic, the park was satisfactory. We would not stay there again. We are not interested in nice swimming pools and playgrounds. We are interested in a level site with good landscaping, nice views, and good value. Our site was level, no view, small grass patch and small rock for landscaping. We camped at Spanish Trail RV Park & Campground in a Motorhome. National parks, Canyonland and Arches, are close and we recommend a visit. Good Restaurants in Moab. We recommend Moab Diner. Rather expensive. Has a beautiful pool and hot tub. The parks in town that are also nice were $5 to $10 cheaper but we didn't see them until we were already parked at this one. There are some wonderful trails to ride your Jeep or 4x4 on. Had a lot of fun but also got lost on a trail. Thankfully an angel was on our shoulder and helped us out and we got home. We will be careful next time. We camped at Spanish Trail RV Park & Campground in a Motorhome. Great location with views all around. Much to do in area. Great mgmt. Good site size, crushed stone base all connections great. Would definitely return if in area. We camped at Spanish Trail RV Park & Campground in a Motorhome. I'll start with this. We're not private RV park people. We are state park, national park, US Forest Service, COE, etc people. We like picturesque views space between sites, and nearby hiking trails, which often come at the expense of hookups and amenities. But when the Moab area turned into a blast furnace and we both got heat exhaustion, we needed hookups for a night. So we came here. It's a private RV park. Basically a large gravel lot. Spaces are separated by a patch of grass and a tree. There are some nice red rock hills in the distance that you could drive to. There's a busy highway going by. By state or national park standards, blecch. By private park standards, it's pretty nice. The grass patches provide a decent amount of separation. The pool is very nice. The water pressure is very high (bring a regulator or you will break your coach). The showers could use some TLC, but the water was hot and they weren't too scary. Laundry machines are cheap for the location. People were nice. And the power was stable on a 95 degree day. That's all we really needed. We camped at Spanish Trail RV Park & Campground in a Motorhome. It's Moab. Arches, Canyonlands, Dead Horse Point. Hiking, biking, 4x4ing. This RV park is located 3 miles south of Moab on Hwy 191, so expect some highway noise both day and night. The WiFi is very good, in non-peak hours (i.e., not during supper hour). Sites have a gravel driveway, a patio stone walkway that separates the driveway from a green space that has a picnic table. Most sites have mature trees that provide much needed shade in the hot Utah summers. It was necessary to disconnect, but there is space to park the truck next to the RV. There is a lovely new pool area with comfortable loungers, chairs, and tables, which is a wonderful place to relax after a hot day in the sun exploring Arches or Canyonlands. There is a clean laundry room ($2 wash, dry = $1.50). Unfortunately some ignorant campers wash their pet paraphernalia in the machines and do not remove the pet hairs after use, so check your machine before loading. I looked at several of the other RV parks in Moab, and Spanish Trail was one of my favourites. 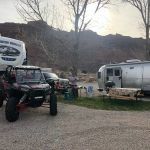 Most RV parks in Moab are gravel lots, with no trees and no pool. 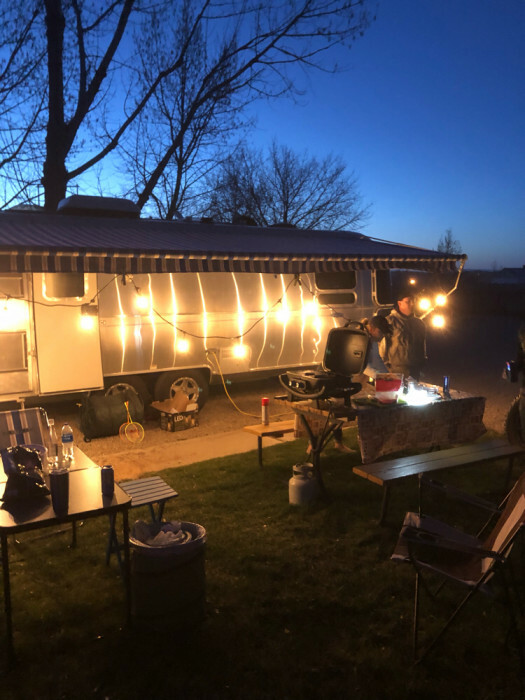 We camped at Spanish Trail RV Park & Campground in a Fifth Wheel. Moab has several outfitters, a good variety of restaurants, a small state liquor store, and a few grocery stores, with City Market being the largest and having the best selection. Diesel prices are high in this town with all stations selling at about the same price. If coming from the south fill up at the Mobil station in White Mesa (10 miles north of Bluff), where prices in the Navajo nation are substantially reduced. This is a lovely campground just outside of Moab. 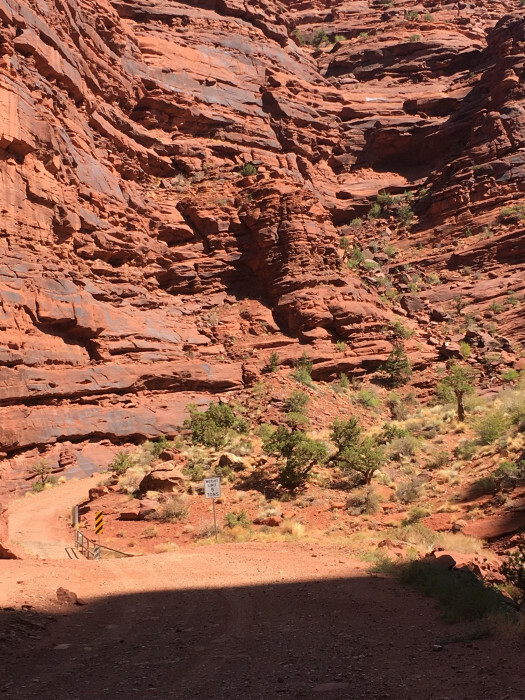 The campground practically backs up to the wall of red rock cliff that runs along 191 and it is just beautiful! We were traveling in the summer so we knew it would be hot. But the swimming pool was wonderful for those hot mid-days! Our site had a little bit of shade. Some are more shaded than others. We had hummingbirds circling our camper the day we arrived so I decided to buy a feeder. Within 30 minutes, I had a hummingbird! More arrived over the next few days and they were so fun to watch. The Wifi was fast. Everyone that worked (and camped) on the premises was so friendly. We drove over to Dead Horse point one day (recommend by one of the camp hosts) and we also drove around the Sand Flats Recreation Area. One day we will come back and rent a Rzr to run the hard trails. We camped at Spanish Trail RV Park & Campground in a Travel Trailer. This looked like the nicest park in the Moab area. Great new pool and spa. Beautiful location. There was a large tree on our site and we could not extend our awning. We had a long pull thru site however you were unhooking and backing up your truck on gravel and up a hill to hook up when leaving. This would be difficult if you do not have 4 wheel drive. Arches national park was spectacular. 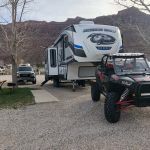 We camped at Spanish Trail RV Park & Campground in a Fifth Wheel. Arches National Park and Canyonlands National Park are very close by. We were in lot 208 which had nice grass and trees to shelter the RV from the sun. It was a little tight getting the trailer situated and level but with patience it was doable. Nice pool and very clean facilities. Dog run not too good, barely adequate and highway noise was an issue too although very quiet at night which was good for us... We'd stay here again and probably will. Nice campground and great service. 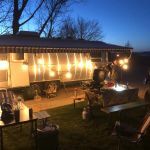 We camped at Spanish Trail RV Park & Campground in a Fifth Wheel. Great park. Mostly retirees when we visited. Good sites with grass, a shade tree and nice, clean picnic table. Level gravel. Beautiful pool and spa, used almost every day. Best laundry room we have ever used any place! Lots of washers and dryers and they dry in one $1.50 cycle!! Great location and the price is amazing for the amenities. Super friendly workers. Good dog area. We camped at Spanish Trail RV Park & Campground in a Motorhome. We went out in our Jeep every day. Sunday brunch 7am-2pm at Red Cliffs Lodge is $15/pp and is amazing. Seating on deck or patio overlooking the CO river. Went twice. Schezwan Chinese is very good. Pasta Jays and Zaks are not to be missed. We do take out for all but Zaks. If you have not done, Jet Ski and Zip lines are GREAT FUN. Free air at Shell station across the street from RV park. They also fill propane. So close to all the National Parks. Restaurants close by. Don't miss the Moab Museum. Mondays are free and it is worth the stop to get the history and background to the area. We love Moab. Some towns we've been to have lots of tshirt shops with junk in them. Moab has lots of nice shops and plenty of good restaurants. I hope we can return here. If you go into the national parks go early leave early in the day, they were really crowded by mid morning! Anytime you're in Moab, Milt's Hamburger is a must! This park is south of town, if you're coming from the north keep driving and driving until you start leaving town and think you might have missed it. Check out the Arches National Park. There are a lot of rentals (jeeps, bikes, tours, etc) I recommend reserving in advance to guarantee availability. 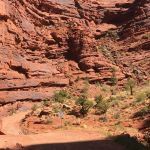 Best dog hike in Moab area: Morning Glory Bridge trail. Three miles up Colorado River from town. Moab Diner was excellent, and good value. Of course, go to Arches National Park and I would recommend Dead Horse State Park, there's an interesting story about Dead Horse Point and a great views of the Colorado River. Careful to shop around for fuel prices, $ 0.25 more per gallon from Shell across from campground than further in town. We used this Park as a base to visit Arches and Canyonlands National Parks. We very much liked the City Market Grocery Store which is part of the Kroger chain. Lots of great restaurants in town. We really enjoyed dinner at Sunset Grill up on the hill, Electricafe for lunch and the Broken Ore was terrific for dinner. Recommend Susie's Branding Iron cafe just across US-191 for lunch & dinner, and the Jailhouse Cafe in town for breakfast. It's Moab! Extremely busy, even for October but Arches, Canyonlands, Dead Horse Point State Park are all easy drives. Scenic Loop along US-128 past the LaSal Mountains has some tight "s" turns but the views are spectacular. Lots of great restaurants to choose from. Had to use the ER at Moab Regional Hospital and staff and ortho surgeon they referred me to were excellent. People come here to see Canyonlands and Arches National Parks, which are to be seen, but the real highlights are Dead Horse Point State Park and Utah Highway 128. The state park is $10 for a 3 day pass and is spectacular. Drive 30 miles or so northeast on hwy. 128 along the Colorado River for some of the best scenery in Utah. The nut brown ale at the Moab Brewery is good, too. Great location to explore National Parks in the area and do other adventures: rafting, Canyoneering, 4 x 4, hiking, biking. Enjoyed excellent sushi at Bangkok House which was so close, we could have walked to dinner. When making reservations, do not take the back row, they are very close to high voltage power lines. Ask for a site that has a mature tree that provides shade, unless you have a satellite dish that is not mobile. Sites on the south end have young 10ft. trees with full sun. Convenience store, gas station, and restaurant are located across the highway. High winds are common, recommend you stow your awnings before leaving the site. Lots to do in this area, the Arches, Canyonland, rockshops. Town is full of restaurants, gas stations, and gift stores. Actually a beautiful small town but lots of traffic and people all the time. Would recommend taking a float trip on the Colorado River with Canyonlands Field Institute. Had a guide who was a geologist and gave a great lecture on the area as we floated down the river. A few small class II rapids but a very nice trip. Dead Horse State Park is also worth the trip. Looks like a half sized Grand Canyon. Close to Arches and Canyon Lands. 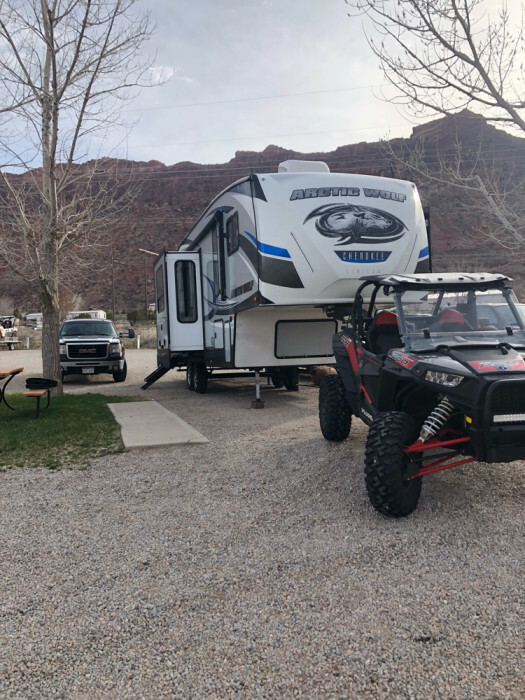 Unless you are into archeology and the history of this part of our great country, you may get bored unless you are into ATV/UTV rentals, river rafting, hiking out the wazoo - which is plentiful as well. Moab area is a high value recreation area for National Parks, 4-wheeling, and other activities. Road through Moab very crowded. We sure enjoyed a dinner up at the Sunset Grill - lots of tables with window views and a big balcony when the weather is nice. We had good food and great service there. The Park is at a great corner with a gas station across the street and Suzie's Branding Iron also across the street. Great comfort food and try the fried bread with butter and honey. To die for. 6 washers and 6 dryers. 1 of the washers was not working when we were there and they were pricey but worked well. Both Canyonlands and Arches National Parks are close and really fun. Be careful if it is blowing because you will get sand blasted. Arches National Park was beautiful as was Canyon Lands National Park. Close to Arches National Park and Canyonlands. Moab has a lot of restaurants and tours. Well layed out park with no appearent full timers. No patio, but there is a stamped-concrete "sidewalk" strip next to the camper pad, between 2 and 3 feet wide, nice in rainy weather. An interesting feature of this campground: windshield-cleaning stands (2 of them)! Bathrooms are older, squeaky clean, but not air-conditioned. Nice laundry area, but expensive (washers $3 each. Arches gets crazy busy between 10 and 2. We went real early, and thought the shadows provided excellent photo opportunities. We were told part of the overcrowding was due to so many European and Asian visitors. Apparently the NPS markets our parks aggressively in these areas, and these tourists help the adjacent commercial businesses thrive. Canyon lands was much easier to see, but is very spread out, and be sure to factor in drive time. We ate at Blue Pig BBQ. Very good. Hogans art gallery had lots of interesting products and unexpected art work. You can use this park as a base for exploring Arches National Park and Canyonlands National Recreation Area. Are you affiliated with Spanish Trail RV Park & Campground ?